NOTE: This information only applies to mLinux 3.x firmware which uses BlueZ4. For Bluetooth on mLinux 4.x or higher, refer to BlueZ5 Pan Setup and BlueZ5 Serial Setup. The device includes BlueZ 4 software used as a Bluetooth stack. To operate, you must install BlueZ 4 on your Linux computer. For newer levels of Linux, you may need to find BlueZ 4 outside of the normal software package manager. You can also use BlueZ 5 with Ubuntu on your Linux machine. You need to set up BlueZ 5 with compatibility mode for BlueZ 4 on your PC. 1. Find the file /etc/systemd/system/dbus-org.bluez.service. If you log in through the debug port to the device using Minicom, you need to change the Minicom control character. You can’t have two levels of Minicom and control both with the same character. You can also use SSH instead. This command displays the Configuration menu for Minicom. 2. Under the Configuration, select Screen and keyboard. 3. Enter the command key: B (the resulting command key is <ctrl> + B). 4. Select <esc> which returns you to Configuration. 5. Select Save setup as dfl which sets your recent configuration as default. 6. Select Exit from Minicom. Bluetooth resets automatically on reboot. The other system should now see the connection. Now you have a TTY connection to communicate. 10. Type a message and watch it appear on the other side. 13. Now enter the appropriate rfcomm command on both sides and the link should come back up. 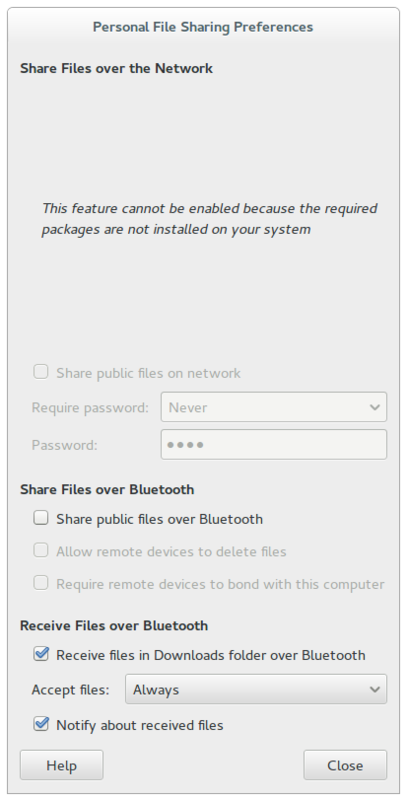 To do File Push on Bluetooth, you first must verify your computer runs Ubuntu with Bluetooth. Use the Ubuntu system with Bluetooth to receive the data. 2. In Ubuntu, under Personal File Sharing Preferences and Receive Files over Bluetooth, check Receive Files in Downloads folder over Bluetooth. 3. In the drop-down, Accept files, select Always and check Notify about received files. Received files will be in the Downloads directory. In this case, the MAC address is 5C:F3:70:74:04:AF labeled as BD address. 5. Copy a large file to the device for testing. Under OBEX Object Push, look for Channel in the listing. In this case, the channel number is 9.